How to care for my new tattoo? Once the tattoo is complete, your tattoo artist will clean the area, apply ointment, and cover it. You should leave the tattoo covered for 4-6 hours. This is to protect your tattoo from airborne bacteria. After sufficient time, carefully remove the tattoo covering and gently wash the tattoo with lukewarm water and mild, unscented liquid antibacterial soap. Use your hands to rub the tattoo, do not use a washcloth, loofah, or any sponge to clean the tattoo, as these may harbor bacteria and irritate the tattoo. 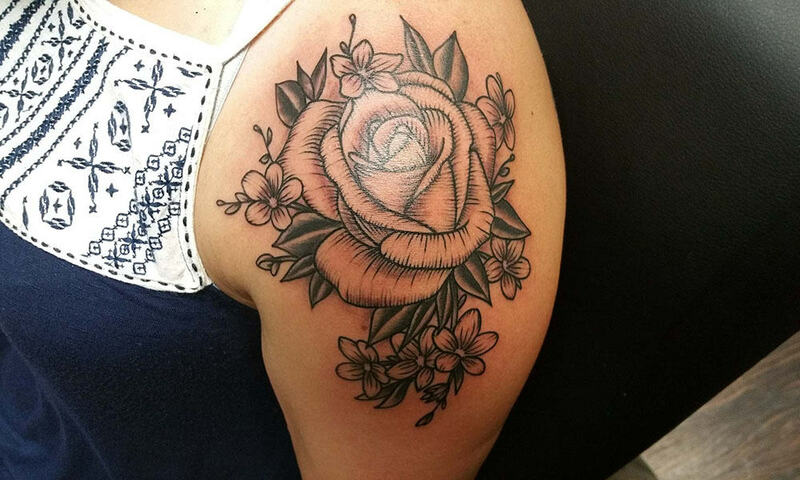 Pat your new tattoo with a clean, dry, soft towel. Do not rub the tattoo, as this may cause some irritation. Allow the tattoo to air dry for a few minutes, allowing it to breathe and any excess moisture to evaporate. Apply a non-scented, water based ointment such as A&D to the tattoo. Make sure to apply only a very thin layer that’s just enough to make the tattoo shine and rub it in gently until it’s absorbed by skin. It is very important that you do not apply too much, as you do not want to suffocate the tattoo. Continue applying the ointment after each time you wash the tattoo, at least twice a day, for 3 to 5 days or until the tattoo starts to peel. When this happens, you can switch to a regular, fragrance free lotion. Do not use petroleum-based products, such as Vaseline. They are too heavy and may clog the pores, causing breakouts on the tattoo. They can also draw the ink from the tattoo to the surface of the skin, causing the tattoo to fade before it’s even fully healed. Continue to wash and moisturize your tattoo twice a day until it is fully healed. This initial healing will take up to two weeks. During this time, you can expect the tattoo to start peeling or flaking, somewhat similar to a sunburn. Some colored skin may come away as the tattoo peels. This is completely normal, so please do not panic! Do not peel, scratch, or pick at your new tattoo, no matter how tempting it may be! You should avoid swimming in a pool or soaking in a bathtub until your tattoo is fully healed. Do not expose your new tattoo to direct sunlight for at least 3 to 4 weeks. After your tattoo is fully healed, you will still need to protect your tattoo by wearing a good sunscreen. This will prevent your tattoo from fading in the sun, keeping the colors true for longer.